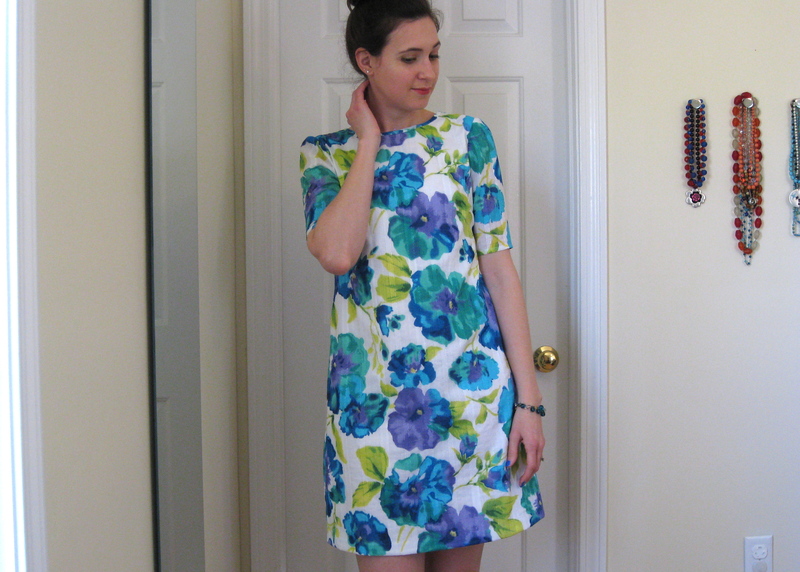 the laurel dress by colette patterns is one of those that took a while for me to fall in love with. i suppose, like many, my reaction was a bit meh initially. however i kept loving everyone’s versions of the pattern, and eventually i decided to buy it. i knew i had to do a proper muslin first because to be honest, i wasn’t sure if this shape would work for me. woof. my first try was not good. i graded from a 6 on top (with a SBA) to an 8 on bottom. it was all sorts of wrong and i tossed it in the corner for a time out. after a couple days of thinking, i decided to come down to a size 2 up top and grade out to a 6 for the waist/hip. i did a 3/8″ FSA, and removed some width at the top of the zip at CB instead of making a neck dark. ahhh! so much closer! i didn’t even bother with an SBA, and the top portion was basically perfect aside from the neck gape. i still had an issue with the hips area, so i shaved off the top of the hip curve (maybe i have low hips? actually that would explain a lot…) and called it good. 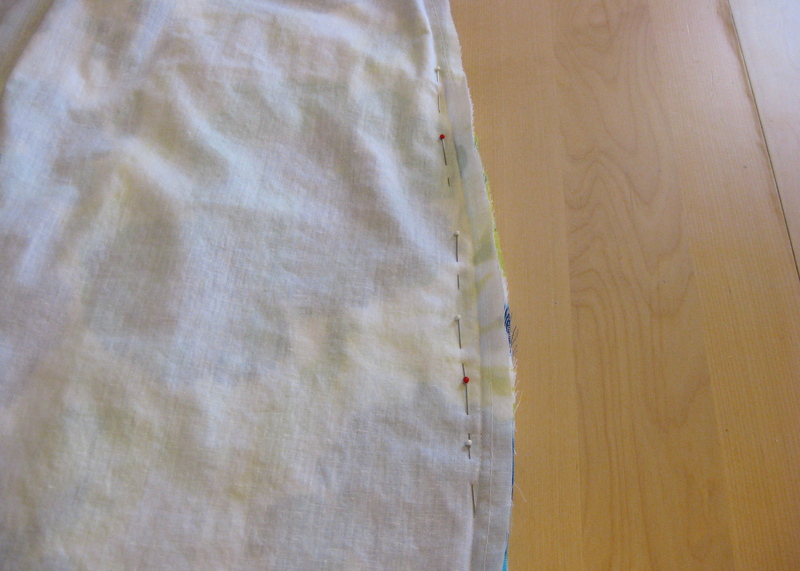 since my fabric is mostly sheer, i underlined the front and back with muslin. my fabric has this really cool woven stripe, and the underlining makes the fabric design stand out something fierce. i sewed it up, and when i tried it on i was still left with some weird upper hip flanges. i ended up taking out the curve of the hip area, and marking nearly a straight line from the top of the curve to the lower notch. it’s weird. i struggled with fitting CP designs so much in the past—cutting, taping, butchering… as it turns out, a lot of my troubles could have been fixed by starting with a much smaller size. this is a pretty straightforward make. i certainly didn’t rush through the sewing here, and i only needed two days. many people have omitted the zip on this dress, and i don’t know what kind of contortionists those people are, but there is no way i could get this on and off without a zip! i went with an invisible zip, stabilized with tricot fusible from sunni’s shop. this stuff is the best, and makes inserting zips a breeze! it’s been a while since i did an invisible zip, and it went in perfectly the first time. i do STRONGLY suggest that you put the zip in before attaching the front of the dress to the back pieces. it is a thousand times easier that way. 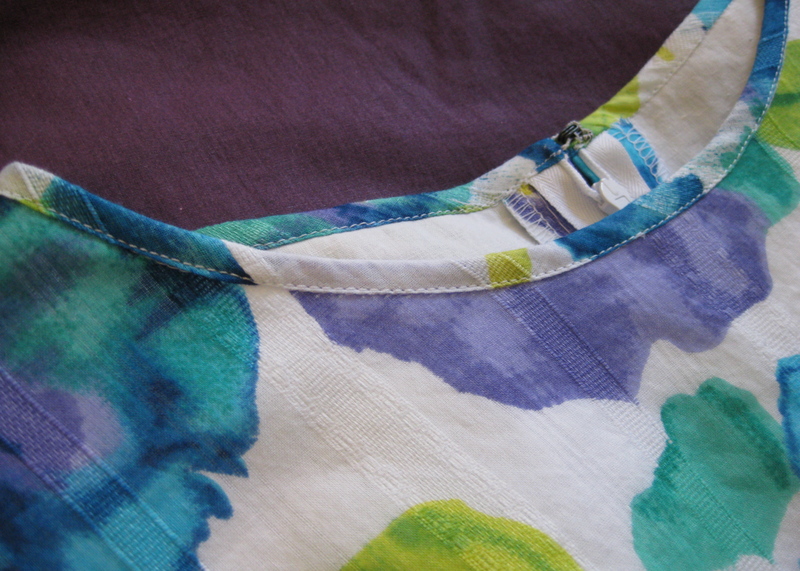 i did the bias binding at the neckline per the instructions, but the sleeves i simply turned a hem and topstitched. the sleeves are also supposed to be bias bound, but this fabric was already pretty prone to fraying due to the loose weave. i was good and stitched the hem by hand. since i had underlined the fabric, it was super easy to do this invisibly. fit-wise, the armholes are a tad snug, so that’s something to watch out for. also, it never occurred to me to check the width of the lower edge of the sleeve—also tighter than i would have liked. next time i’ll most likely go up a size for the sleeve and armhole. then, i do have a tiny bit of gaping at the neckline. i had taken out some room at the top of the zip, but i think i could adjust the angle of the shoulder seam to help it sit a little nicer. but all in all i am very happy with how the dress came out. and that’s about it folks! i suspect i’ll be returning to this pattern a few times since it’s so quick to make, and, let’s face it, shift dresses are everywhere these days! This so cute on you! 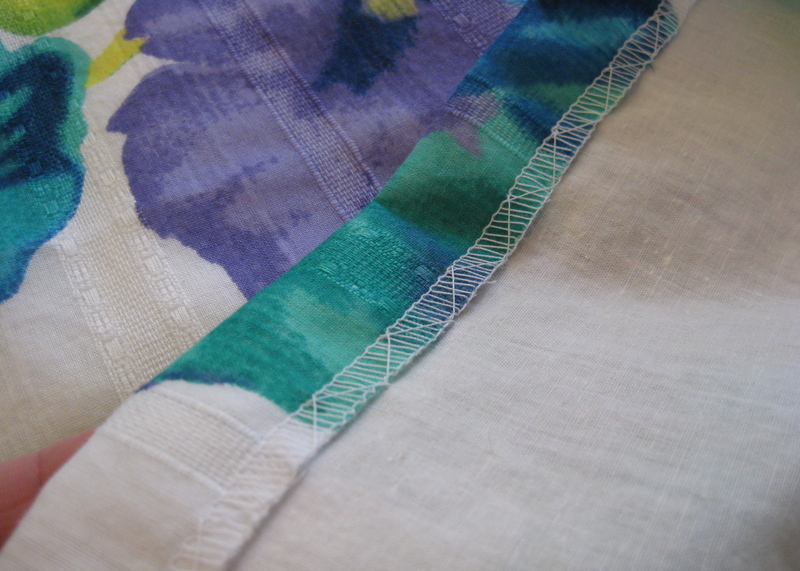 And look at that gorgeous bias binding — amazing job on the topstitching. I’ve loved Laurel since it was released, and am just waiting until I’m done nursing to make one for myself! thanks! i’m sure you’d love this pattern! Looking at your dress I realize that the reason I can get mine on and off without a zipper is because mine is still too big. I need to shave some of the hip curve out of my next one, too. I loved reading all of your details and your finished dress is so pretty! thank you! it’s tricky to get the hip placement/curve just right, but as soon as i did i loved the shape so much! i’m looking forward to making a couple more! This is such a pretty spring dress! This is adorable! It looks wonderful on you! I need to revisit this pattern and sort out some fit issues. I wasn’t very happy with the way mine turned out, and my attempts to fix it were clumsy and probably did more harm than good. It pays off to have a nice shift dress pattern, though- they don’t use much fabric and are a great way to showcase a nice print like this one! You look so springy! I love this print and the Laurel looks amazing on you! thank you! springy is exactly what i was going for! Sooo pretty! Great pairing of fabric and pattern. And your binding looks perfect, natch. 🙂 Low hips, aka long waisted? That would make sense actually, aren’t you tall? Sorry if I’m remembering that wrong, HA! But if you’re taller than about 5’6″, it would make sense that you’d need to lengthen somewhere (or more than one somewhere) depending on your proportions. Anyway, I love your dress, and I’m sure you’re glad to have the fitting sorted in this one — it’s a great blank canvas pattern that you can make again and again. Such a pretty and chic dress on you, I love it! The stripe detail in the fabric is cool too. 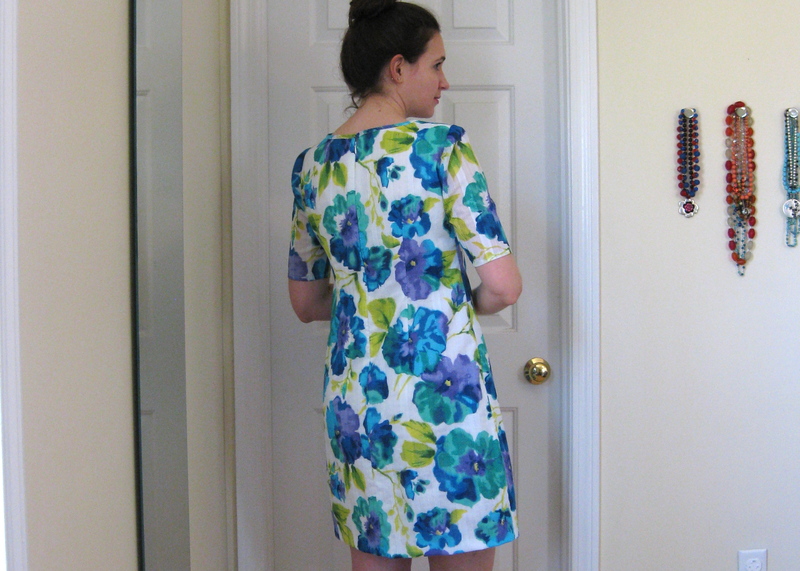 I have made this pattern 4 times (2 tops and 2 dresses) one dress I made without a zip and I keep meaning to go back and add one, because it does take some maneuvering to get on and off! I really should come back to this pattern sometime, thanks for reminding me how cute it can be! thanks! it’s so quick to make, one (or two…) is just not enough! It’s just so beautiful! This shape totally works for you! Now you have me thinking about making one! thanks gail! i wasn’t sure i’d like it, but (surprise, surprise) all it took was a good fitting. i bet you’d like it too! I think we might have very similar fittimg issues with CP. I graded from a 4 to 6 to 8 in my first version of the Laurel. I did an additional SBA, widened the shoulder and also added a 1/2″ plus used a smaller seam allowance at the lower edge of the sleeve. BUT! I’ve now made the shirt version once and the dress twice and I love them all! The second dress version I shaved off most of the hip curve as well. Your version is super cute! man, i so wish i would have widened the sleeves! i have pretty spindly arms, so it wasn’t even a thought. i could re-cut, but i don’t think it’s worth the effort. oh well, next time! Beautiful! 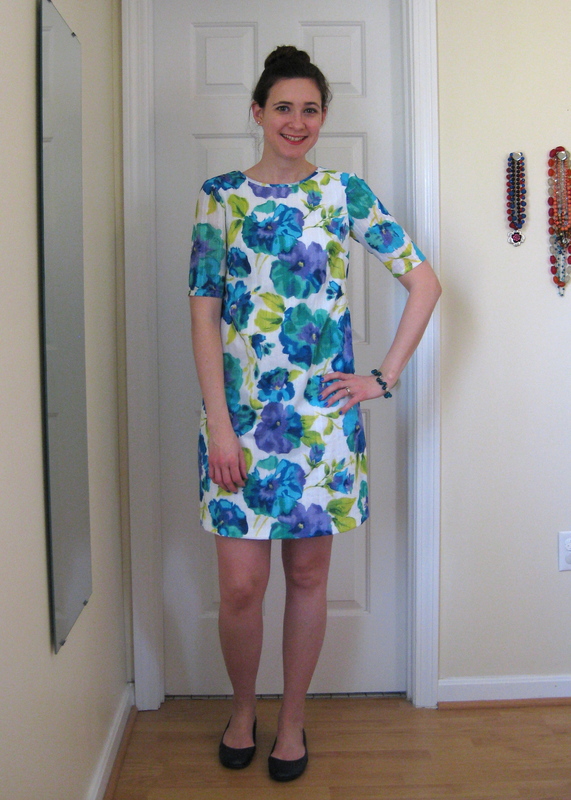 I love a good shift dress and this one was worth the effort. This dress is absolutely gorgeous on you, such a great print. I love love love this fabric.. Perfect for a spring or Easter dress!! thanks lady 🙂 it gets its inaugural wear on easter… woot! This is beautiful, Lisa. I made a knit Laurel for the winter, but your post really makes me want to try a happy springy one with a woven. Beautiful work with the neckline binding, and just everything! thank you! this is a nice all-season pattern–i initially wanted to make up a fall version but never got to it. a knit one is also on my wishlist! Such a pretty cheery summery dress 🙂 I tried on something like this at Zara the other day! I’ve heard a few people say that Colette Patterns need a lot of adjusting, I know they draft for a C cup as standard. This was so worth the effort, it’s lovely and that fabric choice is perfect. I’m especially impressed with the bound zipper tabs, most impressed. Hi Lisa, your dress is a sure sign that warmer weather just has to be on its way! While we’re waiting, though, I’ve nominated you for a Liebster award, so if you have a chance to stop by my blog, there are some questions for you to take a look at! A perfect spring dress…just beautiful.